Kids of all ages are obsessively playing Fortnite: Battle Royale, a bright, brash multiplayer shooter. Released in September 2017, it is one of the biggest games out there, attracting increasing concern from mainstream media. There are clear chances of either your children or their friends are passionate fans. But maybe not as much as this 14-year-old champ from Long Island, who had earned 200K US Dollar (approximately Rs. 1.38 crores) just playing the video game Fortnite. Identified as, Griffin Spikoski, from Smithtown, New York reportedly spends about eight hours a day on weekdays and 18 hours a day on weekends playing Fortnite; which he admits is too much. His YouTube video, of playing the online game, is going viral now, garnering millions of views. Fortnite and PUBG Addiction Worries Parents: But Does it Have Benefits? Yes, And No! Spikoski has a YouTube channel, and he goes by the name Skeptic online, where viewers tune in to watch the young gamer competing in the online battle royale game. 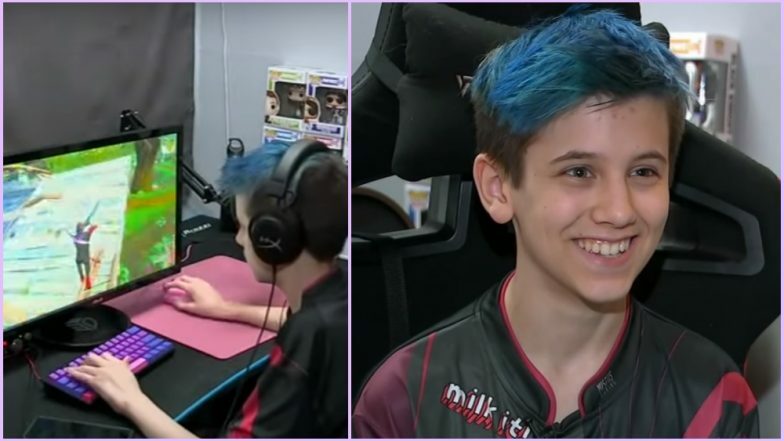 The teen was recently interviewed by WABC-TV, where he explained that playing Fortnite is “like my job.” It all began nine months ago when Griffin uploaded a video on YouTube which showed him beating a famous Fortnite gamer. That video reportedly gained 7.5 million views, and the count is still on. Soon after, money started to roll in from subscribers and YouTube advertisers. Spikoski YouTube channel has above 1 million subscribers, and he had made appearances for Samsung, PGA and the Miami Heat. What Late-Night Gaming on Your Mobile Phone Does To Your Eyes? Wondering what his parents' reactions would be? Well, they guide him to balance his school work and video gaming at a point. His dad, Chris Spikoski was quoted in the ABC affiliate as saying, “We try to keep him humble about it. We try to find the right balance between his school work and just keeping his priorities straight.” The family has also created Sceptic Gaming Inc. And has hired a financial adviser and an accountant. “I want parents to know that, you know, if their kids do enjoy playing games and they have a passion for it and they're really good at it, they should treat it as any other sport,” Spikoski's father added since the concern among parents is increasing. Young Griffin says he plans to save the money that he has made and someday he would like to spend it on college or a house. Spikoski and his family are travelling to Berlin next month for an international online video gaming convention.